“It is necessary to make a man better, not by force, but by persuasion,” St. John Chrysostom stated, explaining to Christians that deft evangelism is vital to spread the Gospel. Many Christians today may have never heard of this 4th-century theologian, although he was well-known in his day. One of the reasons for his fame was his rhetorical battle with the Arians, who denied the divinity of Christ and the existence of the Trinity. For instance, the Arian general Gainus was returning from war and asked Emperor Theodosius to have one of the churches set apart for Arian worship. Being that John was the Patriarch of Constantinople at this time, Theodosius conferred with him about Gainus’ plans, but John clearly denied the command. He exalted the cross. He warred against heresy. He was a resolute champion for Christ. John Chrysostom used elocution to defend the true doctrine. John was born in the year 347 A.D. in Antioch, which is modern-day Turkey. His mother was Anthusa and his father Secundus, who was a high-ranking officer in the army, but sadly passed away when John was just an infant. Anthusa, a devout Christian, taught young John about the Scriptures. She thoughtfully found the best teachers for him, including Libanius. This sage pagan taught John his the amazing skills of dauntless discourse and debate. When John graduated from this prestigious instructor, he decided to devote himself to the practice of law, but once he realized the wickedness within, the talented scholar wished to become a hermit. Pleading to her son, Anthusa begged John not to depart from her until the time of her death. John agreed. So while his mother still lived, he became a church reader. When Anthusa died, he cloistered himself in order to study the Bible without emotion. He also greatly helped the poor, not just with money, but with spiritual guidance. Consequently, in 381 John became a deacon. In 386 he was promoted to the priesthood. In 397 he was elected Bishop of Antioch. Finally, John became Patriarch of Constantinople the following year. His rhetorical training fashioned John into the masterful preacher he was to become. John Chrysostom was a natural leader, which came at immense risk because of the danger of his age. Chrysostom is Greek for “Golden-mouthed” — a nickname that was extremely explicit. Through his eloquent homilies, John converted many pagans to Christ. John also used polemics to decimate the opposing argument by aggressively debunking their cause, such as speaking against the unjust abuse by church authority. When John challenged the crooked wealthy and corrupt clergy, they called him a blasphemer. In 403, the sinister Empress Eudoxia, who was an Arian, banished him due to his purposeful sermons. Fearlessly, he accepted his punishment without complaint. The people rioted. John returned. He continued preaching. In the year 404, Eudoxia fashioned a monument of herself right outside a church in Constantinople. John irately compared the empress to Herodias, the wife of King Herod, who had John the Baptist put to death. Therefore, she banished him yet again. Eudoxia was ruthlessly intentional that John’s exile was as painful as possible. On his way to Georgia, John requested to stop at a monastery, and the soldiers who’d been sent to make sure the aged priest kept moving, agreed. When John entered, he fell down before the altar and exclaimed these words with his final breath, “Glory be to God for all things, forever and ever! Amen.” Through his God-given skills, it was providential that John was such a principled servant of Christ and died a martyr’s death in those treacherous and tumultuous times. John Chrysostom is an influence for all Christians. In one way, he was an ascetic and lived a simple life, and in another way, he suffered patiently. John, who is a saint in the Orthodox Church, is also one of the three Holy Hierarchs, along with St. Basil the Great and St. Gregory the Theologian. He is a also saint in the Catholic Church, revered by the Church of England, and was one of the favorite theologians of John Calvin. Revising the normally sung Divine Liturgy at Orthodox Churches, John also authored the Paschal Homilies, which are the sermons recited at Easter. Because of this legacy, there are hymns sung to St. John, both Troparians and Kontakians. Surprisingly, he created the second most surviving early Church writings, while Augustine of Hippo has the most. “The presence of a small Christian community in hostile Islamic Iran is due in part to John’s labors,” remarked one historian. Where would the Church be without John Chrysostom? John was truly a champion of the faith, which was under attack. Adroitly, he protected Christ’s people. By using his knowledge and words, John led Christians like a shepherd tending to his flock. He’s an astounding example for how Christians should act, especially when times are difficult. Although John did not worry about earthly wealth, he cared for the riches of heaven. 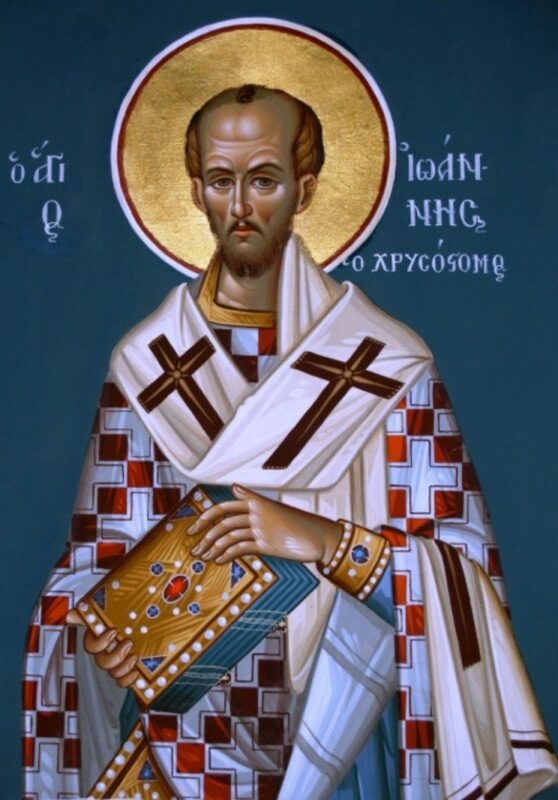 Using his heart and his mind, St. John Chrysostom’s mouth spoke gold for the Lord. Once again, Houston yu have astounded me with your research and interpretation of history. This is a wonderful piece and you deserve many accolades which this Granny readily gives you.